Guided bone regeneration (GBR) is a procedure that has been used in dental surgery for over 20 years for the treatment of bone loss. It involves placing bone graft material within an absorbable or non-resorbable membrane that is impermeable to epithelial cells and fibroblasts. These impede bone formation because they grow at a faster rate than bone can regenerate and this can result in soft tissue, rather than bone, occupying the graft site. The membrane used in GBR blocks soft tissue invasion and provides a chamber to guide the bone regeneration process. The technique is commonly applied to dental implants. When teeth are extracted, it often triggers significant bone resorption (the process by which the body breaks down bone) in the alveolar ridges, leading to defects. The alveolar ridges contain the sockets for the teeth and their integrity is therefore essential for the success of dental implant placement. GBR is used to re-establish sufficient bone in the alveolar ridge prior to the dental implant procedure. But while GBR is a widely established procedure, debate still continues into the optimal way to conduct it and research into this, primarily in the preclinical setting, is ongoing. In particular, questions remain over the ideal type of barrier membrane and whether the addition of other materials to the bone graft to mimic or accelerate the normal process of bone formation are beneficial. As well as the use of synthetic materials in bone grafts, it has been suggested that stem cells taken from the bone marrow could promote the development of new blood vessels and bone formation in GBR. But so far this has only been explored in animal studies using 2D histological analysis. In vivo 3D micro-computed tomography (CT) allows tissue imaging and assessment in real time, meaning it has potential for monitoring the formation of new bone after GBR. In a study, researchers at King Saud University in Riyadh, Saudi Arabia, showed how 3D micro-CT could help advance the study of GBR, by more precisely revealing the first instance of new bone formation, and how it could be used to test alternative types of bone graft material. a group whose defect was filled with tricalcium phosphate granules, a synthetic graft material, soaked in stem cells and covered by the membrane. The researchers monitored the grafts for bone volume and bone mineral density every two weeks up until 10 weeks. The results showed that in both groups treated with stem cells, the rate of new bone formation was faster than in the control group, by approximately 2.8 and 4 times in group 2 and 3, respectively. However, although the rate of new bone formation was faster in group 3, when the researchers examined the grafts at the end of the study, they found that grafts involving the synthetic material did not form a strong connection with the natural bone. Importantly, the researchers found that new bone formation was already detectable at two weeks in rats treated with stem cells. Previous research had only been able to say that new bone has begun to form within 4-8 weeks of the procedure. Furthermore, the finding hinted at the mechanism by which the stem cells enhance bone regeneration. It was not known whether bone-marrow derived stem cells directly mature into osteoblasts – the cells that synthesize bone – or whether they have indirect stimulatory effects on other types of stem cell. 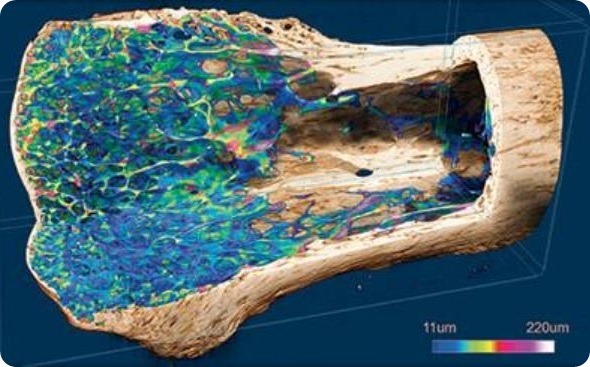 As the process by which osteoblasts form from stem cells takes approximately 14 days, and is known to result in the formation of new tissue by this time, the researchers say the evidence gained by micro-CT supports the idea that the stem cells directly contribute to bone regeneration. In their experiments, Al-Hezaimi et al. used a Bruker SkyScan device to harness the benefits of 3D micro-CT. In vivo micro-CT means the same technology used in a medical CT scanner can be applied on a microscopic level to living samples, allowing detailed “slices” to be taken through animals, non-destructively. Bruker micro-CT technology is available through a range of desktop instruments, such as the SkyScan 1278 which allows full-body animal scans in as little as 7.2 seconds. Furthermore, the radiation dose can be reduced by as much as fivefold while still maintaining high-resolution image quality thanks to the new micro-CT spatial beam shaper. Al-Hezaimi K, Ramalingam S, Al-Askar, et al. Real-time-guided bone regeneration around standardized critical size calvarial defects using bone marrow-derived mesenchymal stem cells and collagen membrane with and without using tricalcium phosphate: an in vivo microcomputed tomographic and histologic experiment in rats. International Journal of Oral Science 2016; 8: 7-15. Dimitriou R, Mataliotakis GI, Maria Calori G, et al. The role of barrier membranes for guided bone regeneration and restoration of large bone defects: current experimental and clinical evidence. BMC Medicine 2012; 10: 81. Liu J & Kerns DG. Mechanisms of Guided Bone Regeneration: A Review. Open Dental Journal 2014; 8: 56-65. Zhang Y, Zhang X, Shi B, et al. Membranes for guided tissue and bone regeneration. Annals of Oral & Maxillofacial Surgery 2013;1(1):10.